In the summertime, if you’re anything like us, you spend as much time as possible in or near the water. Going out boating, climbing to find the best spot for cliff jumping, jumping across rocks along a river or simply lazing on the beach with your family the summer months offer something for everyone. Just as you protect your feet from all the harsh weather in all the other months, it is important to protect them in the summer as well. Sharp rocks, burning hot sand and pavement, summer has its fair share of hazards as well. That is why it is so important to get adequate foot protection. We worked hard to find the best water shoes for men on the market to have you enjoying your summer months to the fullest. Take a look at what we found below. Another fantastic shoe by Aleader, this water shoe mimics a tennis shoe with the impressive talent of being water compatible. With a tongue and laces, these mens shoes can easily be slipped on and off. A completely mesh upper sole allows the water to easily drain from these shoes when wet. The large pockets are great for easy breathability and allow a fast dry keeping your shoes fresher longer. The soles of these mens shoes are incredibly durable flexing with your foot to provide superior comfort. They have a superior tread that grips to the surface even when wet. This shoe has a minimal amount of flat lying seams to help ensure that your foot stays comfortable even when wet. The interior of this shoe is made just as well as the exterior with a ComforDry sock lining and additional arch support. This allows you to comfortably wear these shoes for long periods. As these shoes have more support in them, they transfer nicely from mens water shoes to hiking, gym and everyday shoes as well. This shoe is similar to the Aleader Men’s Quick Drying shoe as it too holds a tennis shoe design. With laces and a tongue this shoe can seamlessly transition between the water and the grocery store. The laces allow you to adjust the fit of these shoes giving you more control to get the fit that works best for you. A Solyte midsole is designed to be lightweight while still offering a superior bounce back motion giving you an added spring in your step. This pair comes with a lightweight ComforDry sock liner that adds cushioning to your foot giving you a more protected stride. This liner is removable increasing the hygiene of the shoe making it less likely for mildew to grow. 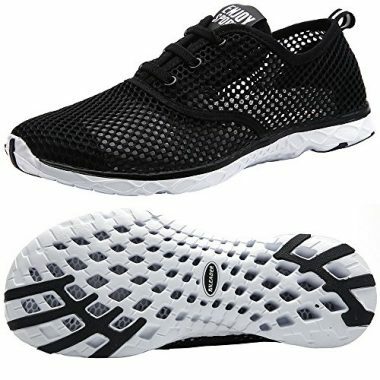 The large squared mesh design on the top of the shoe allows it to fast dry allowing for more use. This also provides superior breathability making this one of the best summer mens shoes on the market. This pair of shoes looks like a regular slip on style shoe. But this changes once you slip them on. They feel amazing! Zhuanglin has created a shoe that is 90% fabric. They have a rubber sole that has drain holes to let water out and air in. Sizes run from 7 to 14 so they will fit nearly everyone. On top of that, there are 11 color combinations to choose from. There are two pull tabs so you can fully adjust where these shoes sit on your foot. The shoes have been designed to dry faster than ever. There is open mesh on the top ensuring a seamless fit. It will wrap around your foot and won’t slide around when you walk. You won’t have to worry about doing laces up as the mesh material takes care of securing the shoes to your feet. Most people who try these shoes on will fit as expected. These shoes feature a solyte midsole that has been designed to be lightweight and ultra flexible. No matter what you’re walking on these shoes will provide excellent grip and bend around it. They also have foam to make it feel like you’re walking on a cloud. No longer do water shoes have to be uncomfortable and clunky. 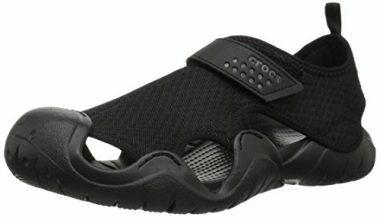 Crocs created one of the most well known water shoes on the market. Their design was so influential that other companies tried to mimic their shoes. The Swiftwater has built on and improved that successful shoe. It uses an open design that gives your foot the most breathability possible. The base has been designed for maximum protection. There is a rubber toe cap that protects your toes from unexpected rocks. The tread allows you to climb rocks or even hike without sliding around on loose terrain. You’ll also love the massage pods built into the footbeds. Yes, this pair of water shoes massages your feet while you walk to the beach. Crocs have made every effort to make the Swiftwater as comfortable as possible. Your heel can be secured against the comfortable support. There is a stylish velcro strap that wraps around your ankle for added support. A mesh material encases the top of your foot to complete the shoe. There are ventilation holes around the middle and rear of the shoe that allow water to drain. 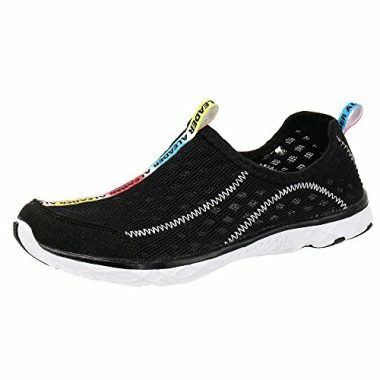 You will quickly fall in love with these slip on water shoes coming in at an unbeatable price. Unparalleled quality make up these mens shoes with their incredibly flexible design that perfectly form fits to the shape of your foot. A durable rubber sole protects your feet from sharp rocks and provides a needed layer in between your foot and hot sand. With an impressive water grip, these soles are designed to keep your feet stable even when maneuvering across wet and slippery rocks. The top of the foot is made from a mesh like material allowing your feet lots of opportunity to breathe. This is great for those hot summer months. This water shoe is lined with a ComforDry sock lining that further protects your foot combing the cushioning your feet desire with unbeatable performance. This helps to prevent mildew from growing in the shoe after prolonged wetness by giving it a breathable layer that is fast drying. Not having a tongue or laces on this shoe means that you will not risk skin irritation in these areas once the shoe is wet. This allows it to sit even more comfortably against your skin. It is easy to see why these shoes top our list for one of the best water shoes for men on the market. 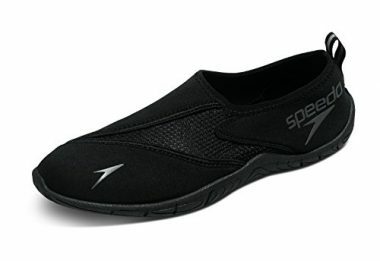 It is no wonder this came in as a top rated men’s water shoes, this shoe my Speedo takes you from your car, into the water and right back out again. This shoes versatility is why so many people are buying it being a great shoe for in water sports as well as beachwear. The superior comfort is what makes people so loyal to this shoe. A stretchy slip on style design has a mesh top which allows it to form fit to your foot perfectly. 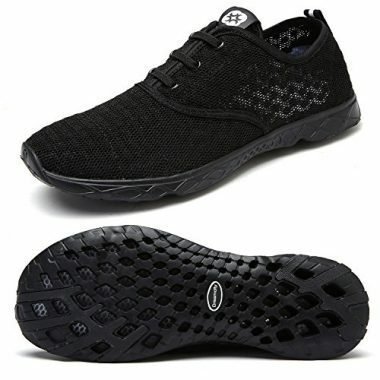 The lightweight mesh design also allows this shoe to dry incredibly fast making it the best shoe for transitioning between in water and on land use. While these shoes may look minimal they have a thick S-track outer sole that leads way to an impressive amount of tread. Perfect for rocky shores, these shoes grab onto the surface holding you more secure. A removable inner sole makes sure that this shoe gives you the most comfortable fit. This water shoe comes in over 10 different colors allowing you to show your personality and buy a pair for the whole family. Use these water socks for men or women with their unisex design. A low riding design makes these look like socks while still having an impressive amount of tread. A great option for those who travel often as these shoes are incredibly lightweight and can roll up to tightly fit into your luggage with ease. The flexibility of this shoe is unique to this design allowing your foot a full undisturbed range of motion. The nylon design hugs your foot with a slight stretch fitting perfectly every time. Despite the socks lightweight design it actually holds quite a substantial outer sole with a non slip design helping make it so you do not slip when treading on slippery rocks. This thick sole also offers much needed protection from hot summer pavement and sand. 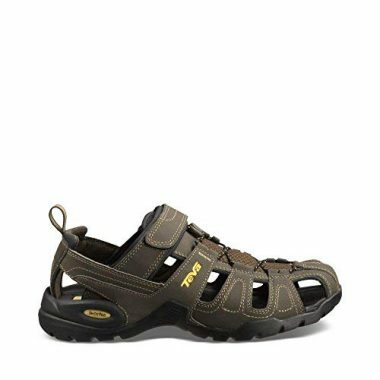 The true beauty of these mens water shoes is that they often feel like an extension of your foot making them an appropriate choice for a wider range of activities. 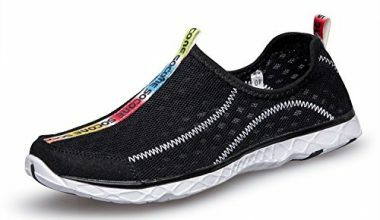 From beach volleyball and yoga, to a comfortable shoe while camping and even a great option for your water sports such as snorkeling or surfing. Merrell makes some of the best hiking shoes on the market. Their water shoes are also top notch coming in with all the bells and whistles. The All Out Blaze Sieve Water Shoe comes in sizes from 7 to 14 including lots of half size helping to ensure that you get the best fit for you. It also comes in 7 different appealing colors to choose from. They have use some of the highest end waterproof leather and fabric combination. This not only increases the durability of the shoe but also makes it much more comfortable. The leather stands up well in the water and doesn’t cause unwanted rubbing or blisters. Merrell has gone with a synthetic sole meaning it will stand up to the wear and tear of long hikes. This water shoe has some of the more aggressive treads you’ll find on water shoes. It has 3 mm lugs that allow you to climb nearly any type of terrain with ease. If you are looking for shoes that you can hike to the beach and wear in the water, the All out Blaze Sieve Water Shoe is perfect for you. The Wave’s waterproof shoe is a great addition to your summer clothes wardrobe. It comes in 27 different color patterns ensuring you’ll be able to pick one to fit your style. Sizes range from 7 to 13 so you can find a pair that fits your feet perfectly. Water shoe reviews agree that these water shoes fit just as you’d expect making them a great online purchase. The Wave has used high end materials and construction to ensure there are no pressure points. A combination of neoprene, rubber and mesh combine for a lightweight shoe that allows your foot to breathe. The rear of the shoe has a drawstring so you can perfectly adjust the tightness you prefer. Teva has one of the better closed toe sandals on the market. 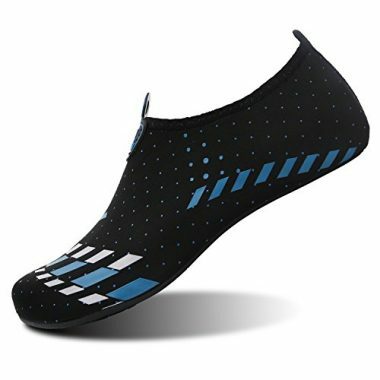 They have really over designed these shoes to incorporate all of the best features you could want in your water shoes. There are sizes that range from 6.5 to 11 with half sizes. This isn’t common when it comes to water shoes. These shoes are also true to their size meaning you won’t have to buy a size bigger or lower. The Omnium Sandal is made from a combination of synthetic, mesh and rubber. They have a pretty flat sole with not a lot of tread. This makes them great for walking on trails but not for rugged trails. You’ll be able to get to the beach without issue. The mesh upper provides comfort while ensuring that your shoe is both breathable as well as provides above average drainage. Teva uses a buckle system and a bungee lacing system to secure these water shoes to your feet. They work well together and make your feet feel comfortable. There are also lots of air holes that allow your feet to breathe without feeling like they’ll move around. When shopping for your next pair of men’s water shoes it is important to get a top quality pair. These are typically much more affordable than your everyday shoes so it is important to get the best on the market. The most important factor for mens water shoes is for them to be quick drying. This feature is as much for comfort as it is for hygiene. 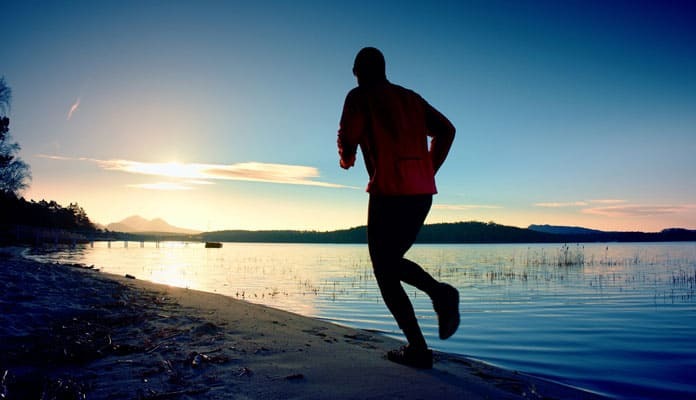 Men’s water shoes are typically seen having mesh tops to give your feet breathability and allow them to dry quickly. This is also an important feature for hygiene reasons as it will drastically reduce the chances of mildew growing in your shoes from prolonged dampness. Being able to remove the sock is an important feature that will drastically reduce the shoes drying time. Having shoes that can air dry will allow for more summertime use. It is important to not be weighed down by the shoes on your feet as typically they will increase in weight even more once wet. A lightweight shoe will allow you to have a barefoot feel while providing your feet with added protection. This is often accomplished by designing a shoe with a lot of mesh. This works as both an effective lightweight layer that is comfortable for prolonged wear. This is also achieved by having a slip on design that doesn’t require laces or any other bulk. This will prove immensely valuable when traveling with your mens shoes. When wearing wet clothes, it tends to chafe and rub a lot more than when dry. The same is true for mens shoes. This is why it especially important that your pair of water shoes have as little irritants as possible. For this reason many water shoe designs do not have tongues and laces as this can cause pressure points in the shoe. While it isn’t likely they carry a seamless design, it is important that there are less seams and the the seams run flat against the skin. This will allow you added comfort when the shoes are wet. As it is for many other activity shoes it is incredibly important for water shoes to have a reliable tread. As you will be using these shoes primarily in slippery conditions it is important that they carry an anti slip design on the soles. This is common and most all water shoes will have a tread that will help your shoe hug slimy rocks and slippery surfboards. This will help to ensure that you stay safe and comfortable. When on the hunt for your next pair of men’s water shoes we recommend looking for a pair that can seamlessly go from swimming in the ocean to camping in the mountains. This means shoes that offer a fair amount of cushioning and support. You will also want to look for a pair that is comfortable enough to wear for extended periods of time as well as those that have a thick enough sole to be worn out of water. This will prove incredibly valuable in the summer months when trips to the beach often start at the grocery store. Being able to properly drain the water that you enter is one of the most important aspects of a water shoe. One of the primary benefits of a water shoe is its ability to properly drain. The drainage ability in a shoe will directly be related to both the material used as well as the shoes design. Obviously, some shoes will have better draining abilities than others. Sandals, for example, will typically have the highest draining capabilities. Many people think that a shoe that is highly breathable or has exceptional water wicking ability will be enough which simply isn’t the case. This is a very important feature to consider for a number of reasons. The most obvious of which is that it will greatly affect your comfort level. With the pooling of water, you will find yourself slipping around in your shoes much more which could be dangerous. The wetness experienced may even cause unwanted rubbing and lead to blisters forming. Having water shoes with proper draining will also work to make you more mobile. Shoes that are full of water will be quite a bit heavier which will make them much harder to walk around in. Not only that, the lack of drainage can cause water to pool making them much more susceptible to mold and mildew growth. This is specifically important for those looking to wear their shoes for water sports. 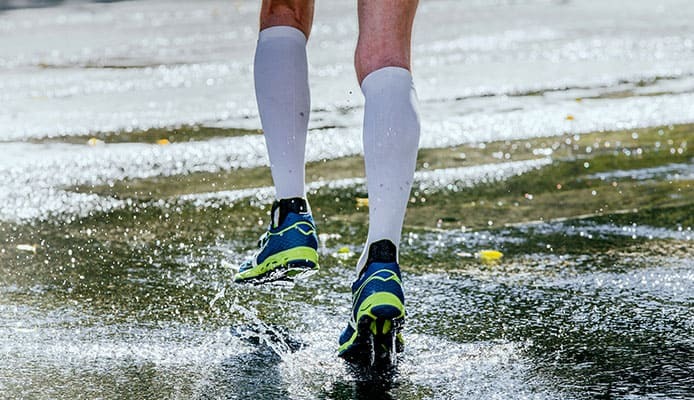 You water shoes should not simply be some that you can wear in the water, but also be something that you can comfortably and efficiently wear out of the water. The best water shoes are those that effectively drain releasing all the moisture from your shoe once you leave the water. When measuring the effectiveness of your shoes, there are two factors that determine the quality of your shoe. This refers to your water shoes ability to drain as much water as possible. This is generally determined by the location of the perforations on your shoe. Shoes that have only drainage from the upper part of your shoes, where the mesh is, will still risk having some puddles remaining. Shoes that feature drainage channels in the lower area, such as on the underside, will more effectively drain moisture eliminating any pools. As you may have guessed, this area refers to how quickly water is able to escape your shoes. This will be determined by the material used in the shoe as well as the size of the drainage holes. Shoes that allow for quick drainage will mean less time that you sit uncomfortably and also can make it so that your shoes drain, and dry, much faster. The fit that you get for your water shoes will depend on your use. In general, you will want your shoes to fit snug while not be constricting. Ensuring that your shoes are an optimal size for your toes to move a bit is important. Shoes that are too tight will risk rubbing and blisters, or even give the feeling of falling off altogether. On the other hand, shoes that are too tight can be incredibly uncomfortable and also risk blisters. If you plan to do activity in your shoes, such as various water sports, then you will want to opt for water shoes that fit a bit tighter. This will allow you proper mobility without risking your shoe from falling off. You’re going to be using these shoes in places that can seriously hurt bare feet. Especially in salt water conditions, rocks can have barnacles and sharp points that can cut up your feet. You’ll need water shoes that have the highest amount of protection you can get. The soles should have grip so you can get in and out of the water without slipping around. This will allow you to also have confidence in your shoes. Being able to know that you don’t have to choose your footing perfectly will allow you to take in your surroundings while you move around. Water shoes should also have straps that secure them to your feet. Your foot shouldn’t slide out of your shoe even when you’re climbing huge rocks. A mesh material is great for securing your foot as it is flexible and can conform to the shape of your foot. Straps that secure your ankle are also excellent options for water shoes. Some companies also include to caps to reduce the effects of stubbing your toes. These are essentially pieces of rubber that encase your toes. Other companies use a thick sole that creates more of a barrier between the bottom of your feet and the ground. This also makes the shoes more comfortable for longer hikes. The shoe that you choose should be based entirely on the way you plan to use your shoe. It is wise to decide whether or not you plan to use your shoes while swimming in the water, as an anti-slip shoe for pool decks or as a multi purpose shoe that has the ability to go in the water. The way you plan to use your shoe will directly affect the type of shoe that you should choose. The grip your shoe carries is an incredibly important part of your water shoe. The grip of your shoe can be represented by the protection that the sole of your shoe provides. This is an area that should not be compromised on as it affects your safety. This, while important in all shoes, is especially important in water shoes. This material used on the outsole of your shoe plays a big role in the grip of your shoe. It is important for the tread to be designed so that water can escape out from underneath it. This is especially important because of the use in wet environments. The lines of the different available types of water shoes have been a bit blurred as more and more manufacturers have come out with options. The types available depend on who you are talking to making it easy to get quite confused. In general, the types center around the activity they are used for. 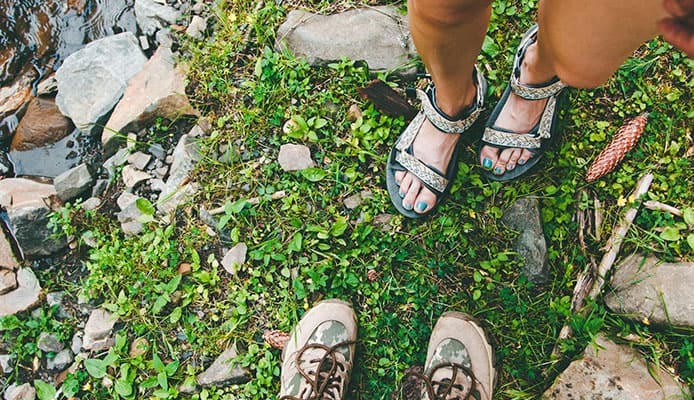 Hiking shoes, boat shoes, swimming and watersports shoes, and beach shoes are the most general terms for hiking shoes. There are then many shoes that are built to be able to transition between many different uses. 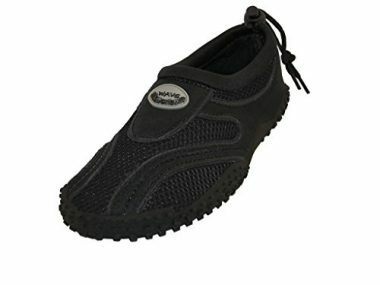 The types of water shoes we are focusing on are based on the specific trait that the shoe excels in. This type of shoe is our most broad category of shoe but still has some defining abilities. For most aqua shoes or water shoes, refer to multi purpose shoes. 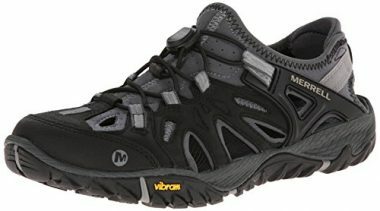 These are designed for performance and long term wear for activities such as walking or hiking. These shoes have adequate drainage allowing for you to trek through streams and rivers. They are unique in that they perform well in and out of the water. They also feature a fair sized sole allowing you ample foot protection. Typically most users do not wear these shoes with socks but this is more of a preference than a rule. This shoe type is designed specifically for use in the water. The material in these shoes is typically the same neoprene material used in wetsuits. This makes them not as ideal for use on land, especially for long periods. Don’t let the name confuse you as this type of foot protection is more shoe than sandal. Think of it as a water shoe but with all the benefits of a sandal. Very similar in style to the aqua shoe, these have no toe protection and larger openings making for better drainage and a more spacious feel. This shoe should be on every boaters wish list. This type of shoe is not meant for performance in the water but rather for use on top of it. This is the style of shoe that most boaters and sailors will turn to as they are built to be able to walk on wet surfaces. These shoes, also referred to as deck shoes, have a non slip sole that provides superior protection. Built specifically to walk on hard and wet surfaces, it is no wonder these are ideal for boats. While these shoes are ideal for use on a boat, they are not built for use in the water. This type of water shoe is relatively new to the game but has hit the market with a bang. These shoes, as the name suggests, are unique in that they have pockets for each of your toes to slip into. Forming a shell that is formed to the shape of your foot, these shoes are more like a sock that has a hard bottom. These shoes are incredibly versatile. They are a great option for the beach, a pool, out on the boat and many more places. There are a few brands in the game, the biggest of which is Vibram. Beach shoes are another broad sort of umbrella style type of shoe that encompasses many different styles of shoes. This term is not really used to describe a single style but rather a destination. From slippers to sandals, there are many different shoes that could fit into this type. Typically, we would count these as lightweight shoes that can go into the water as well as be suitable for dry land, much like aqua shoes. Q: Why Use Water Shoes Instead Of Walking Barefoot Or Using Regular Shoes? A: Water shoes hold two main advantages over being barefoot. They provide a barrier between your feet and the uneven ground you are walking on. This is specifically useful when considering sharp rocks and barnacles that could be at the beach. The second reason they are a better option is that they provide a good amount of grip. As you will be near the water you will be at an increased risk of slipping. Water shoes are designed to have some grip which will help you to keep your feet in place. Water shoes have many benefits over your regular shoes as well. The first being that they are typically much lighter in weight. This is partly due to their superior draining ability when wet. They are also generally much more comfortable when wet than your regular shoes will be. A shoe that is built for water will have much less to worry about in terms of mold and maintenance. Q: How Many Types Of Water Shoes are There? A: While there are many different names out there for water shoes, strictly speaking, there are four main types. Boat shoes, water sandals, wet shoes and aqua shoes are the most understood types of water shoes out there all with their own distinguishable features. Q: Will Water Ruin My Regular Shoes? A: Yes! This becomes even more truer when you are considering use in salt water. Water shoes contain specific technology that gives them the ability to withstand water that regular walking shoes simply don’t have. Your regular walking shoes do not contain these advances in technology which can cause them to breakdown when exposed to water. This will cause permanent damage to your shoes and is best to be avoided. 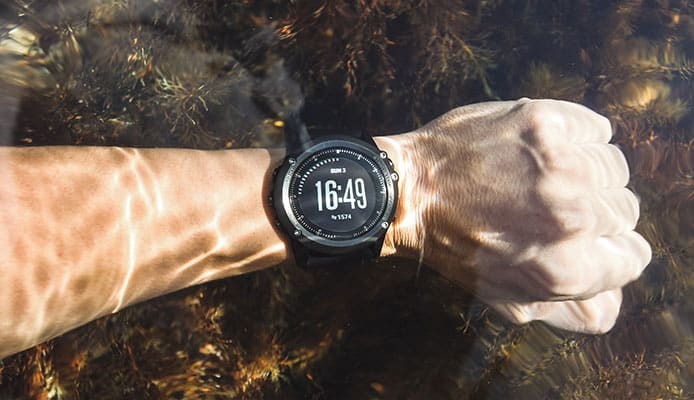 Many people spend a great deal of time either in or around the water year round, but especially in the summer months. This is a time where many foot injuries occur from hot sand, hot pavement, rolled ankles or stepping on sharp rocks. This is all preventable with a lightweight and high quality water shoe. The shoes on our list vary in weight and size as well as functionality to allow you to get exactly what you are looking for. Getting a pair of cool water shoes for men will allow you to take your shoes with you from dry land to water sports in the water such as paddleboarding and snorkeling. These shoes will have a snug feel as you will want to ensure they stay on even when in the water. Possibly your best summertime purchase, men’s water shoes should be at the top of your list for this summers must haves. Did your favorite water shoes make it our list? Let us know how you like them in the comment section below.